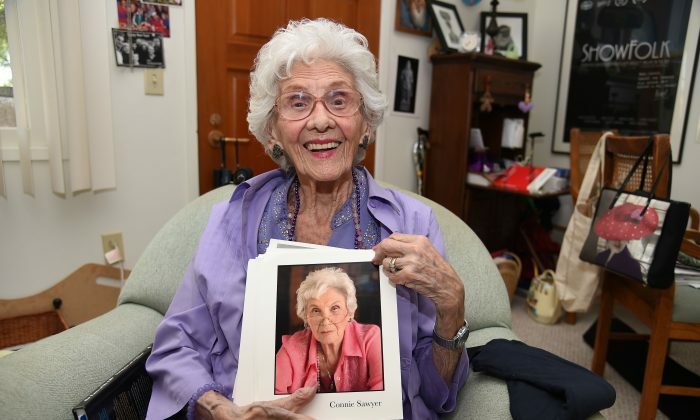 Connie Sawyer, the oldest working actress in Hollywood, died at the age of 105, it was reported. Deadline Hollywood reported that Sawyer, who was born Nov. 12, 1912, in Colorado, started her entertainment career at the age of 8 in 1920. TMZ reported that she started getting acting roles at the age of 18 in 1930. Sawyer has numerous TV credits which span decades. This includes The Mary Tyler Moore Show, Hawaii Five-O, Dynasty, Murder, She Wrote, Archie Bunker’s Place, Home Improvement, Seinfeld, Will & Grace, ER, The Office, and How I Met Your Mother. She actress died peacefully at her home in Woodland Hills, California, according to Deadline. Presumably, her cause of death is natural. She’s survived by daughters Lisa Dudley and Julie Watkins as well as four grandchildren–Hannah Stubblefield, Sam Dudley, Emily, and Carrie Watkins–and three great-grandchildren, Sebastian, Adam, and Maya.